As the name states, these tables are American owned and made in the United States. Their focus has always been on the commercial gaming market such as arcades, tournaments, pool halls and bars rather than putting their focus into home recreational brands. This makes their products extremely high quality and built to last. Their product line includes foosball, air hockey, pool, and arcade games. 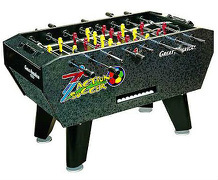 Their foosball tables made by the Great American company reflect the older model of tables that first came about when the game came to the United States. The style is most known for foosball men that have rounded, slick toes. However, when Tornado tables came about in the early 1970's, a newer style man was invented with a pointed toe design that allows for better ball control. Great American currently makes three different table models, the Pro Series, Action, and American. The Pro Series is their commercial table that comes equipped with a coin-operated mechanism and the American and Action are home models that offer free play. The cabinets on all 3 of these tables are known for being bulky. 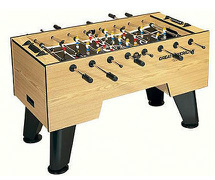 Here at Foosball Soccer, we recommend a heavy cabinet on the table in our must have foosball table features section. However, these tables are bulky without the thickness that we prefer to see on a table walls. We recommend looking for a table that has a 1 1/2 inch thick cabinet design. The Great American tables come in under 1 1/2 inches at 3/4 inch for the American model and 1 inch for the Action and Pro Series models. If you are interested in comparing other features and parts on these tables against competitors, we recommend checking out our table reviews section.